A truly advanced moving average indicator that replaces the stock MA indicator. 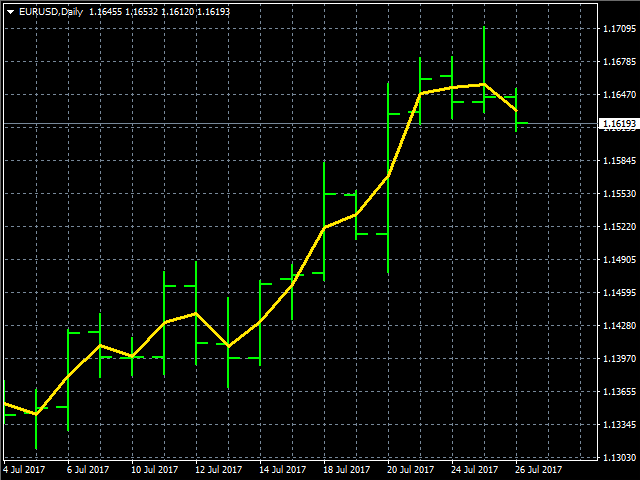 Fully customizable for advanced & unique moving average calculations. 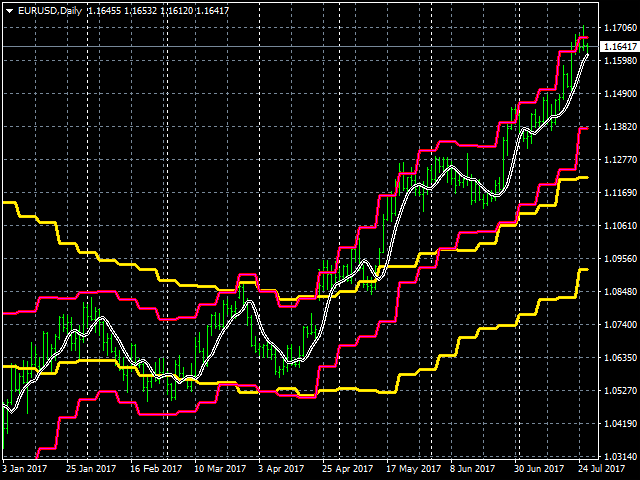 This indicator has a four moving average calculation with a sum divider. Each moving average has its own settings (except timeframe & ATR). Bar shift that takes prices from historical data (less repaint?). Price multiplier per moving average and a divider for all prices. ATR to adjust the prices higher or lower. Shows an initial setting of a moving OHLC average calculation by default. MA TimeFrame = 0; Timeframe of Moving Average. MA Colorful = true; Customizable two color moving average line. 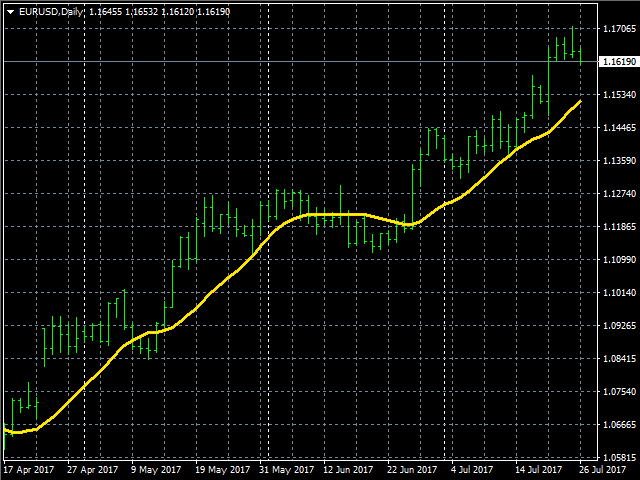 MA Price Divider = 4; Sum divider of four moving averages. ATR Period = 0; 0:Off, or ATR for added MA price positioning. ATR Price Method = 1; 0:ATR added(UP), 1:ATR subtracted(DN). 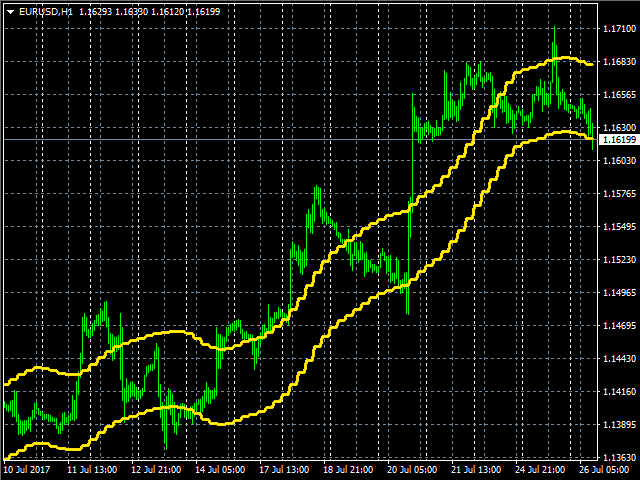 MA1 Period (# of Periods) = 14; Periods of Moving Average calculation. MA1 Shift (# of Periods) = 0; Periods of Moving Average shift. MA1 Method = 0; 0:Simple, Exponential, Smoothed, Linear Weighted. MA1 Price = 0; 0:Close, Open, High, Low, Median, Typical, Weighted. MA1 Price Multiple = 1; Must be 1 or higher. MA1 Bars Back = 0; 0: Current bar, reads historical bars. MA2 Period (# of Periods) = 14; Periods of Moving Average calculation. MA2 Shift (# of Periods) = 0; Periods of Moving Average shift. MA2 Method = 0; 0:Simple, Exponential, Smoothed, Linear Weighted. MA2 Price = 1; 0:Close, Open, High, Low, Median, Typical, Weighted. MA2 Price Multiple = 1; Must be 1 or higher. MA2 Bars Back = 0; 0: Current bar, reads historical bars. MA3 Period (# of Periods) = 14; Periods of Moving Average calculation. MA3 Shift (# of Periods) = 0; Periods of Moving Average shift. MA3 Method = 0; 0:Simple, Exponential, Smoothed, Linear Weighted. MA3 Price = 2; 0:Close, Open, High, Low, Median, Typical, Weighted. MA3 Price Multiple = 1; Must be 1 or higher. MA3 Bars Back = 0; 0: Current bar, reads historical bars. MA4 Period (# of Periods) = 14; Periods of Moving Average calculation. MA4 Shift (# of Periods) = 0; Periods of Moving Average shift. MA4 Method = 0; 0:Simple, Exponential, Smoothed, Linear Weighted. MA4 Price = 3; 0:Close, Open, High, Low, Median, Typical, Weighted. MA4 Price Multiple = 1; Must be 1 or higher. MA4 Bars Back = 0; 0: Current bar, reads historical bars. There is only one buffer, of 0, which presents a value of MTF-OHLC-MA. Improvements to the system could be at any time so we suggest that you possibly backup your copies. Lower timeframes added; all available timeframes are: M1, M5, M15, M30, H1, H4, D1, W1 & MN. Inputs & code optimized; not about the strategy.